A few years ago I noticed one of my personal training clients drinking a green water. I asked her what it was and she said it was a simple mint tea. I had a load of it yesterday – this is it! I drink this whenever I have a some mint left over, which is quite regularly. To be honest it’s so simple I don’t even think this can be called a recipe – it’s just water and mint, hence the simple in simple mint tea! 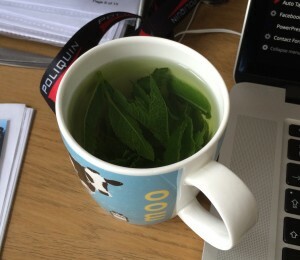 Still, this is the most relevant section of the blog for it to go in, so here is my ‘recipe’ for a simple mint tea. Grab a handful of fresh mint leaves and put them in a mug – feel free to chop them. Personally I just rip them up a bit. Stir around, stab the leaves etc and allow the mint to infuse. If you are interested in the health benefits of mint, click here. Oh, and if you a tea aficionado you should check out this cool tea infuser to make your drink! Drink and enjoy – it’s minty, its zero calorie and it tastes better than plain water! I have drinking pepperment tea since spring. It’s a refreshing taste that’s great. My sin feels smooth. That’s great to hear, Nadine! I really enjoy it!